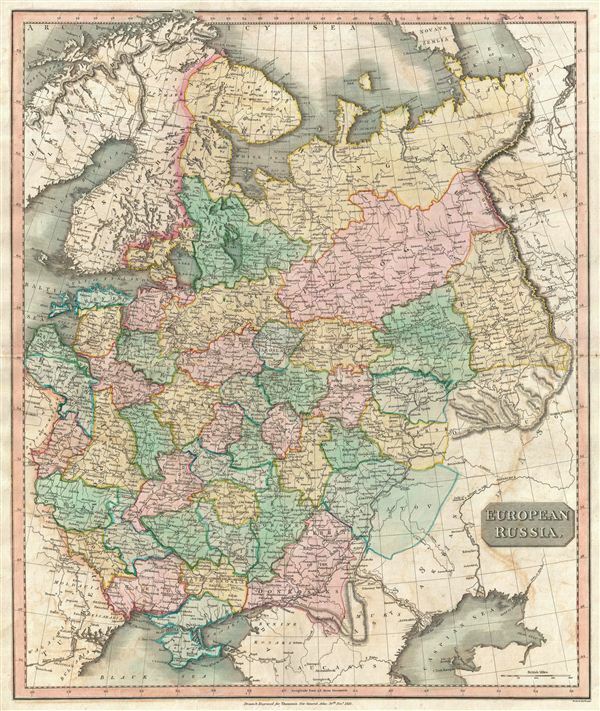 This impressive 1815 map of the European part of Russia is beautifully engraved in the minimalist English style pioneered in the early part of the 19th century. In 1815 Tsarist Russia emerged from the Napoleonic Wars economically insolvent and politically fearful of the Revolutionary fervor that had just swept through Europe. Russia entered into the Holy Alliance with Austria, another internally threatened monarchy, in the hopes of preserving the status quo. In order to shore up Russia's economic position, the Tsars began an aggressive series of expansions into the Caucuses and Asia that would vastly increase the landmass of the Russian Empire. Thomson maps are known for their stunning color, awe inspiring size, and magnificent detail. Thomson's work, including this map, represents some of the finest cartographic art of the 19th century. Relief is shown by hachure with towns, cities, and major topographical features identified. Engraved by Samuel Neele in 1815 and issued as plate no. 8 for Edinburgh cartographer John Thomson's 1817 edition of the New General Atlas. Thomson, J. A New General Atlas, (Edinburgh) 1815. Very good condition. Original centerfold exhibits some light toning . Light soiling to outer margins. Original platemark visible. Blank on verso. Rumsey 1007.034. Phillips (Atlases) 731. Newberry Library: Ayer 135 T4 1817.